We begin the Episode in a Flash Forward (that was a good show, I miss it) of a pretty epic looking fight between The Flash and Dr. Light. The Flash takes a hit and goes down for the count, Light gloats in victory… then we’re back to present time. Dr. Light is in the Pipeline and The Flash is trying to get her to help him; she gives him a few details about how Zoom is supposed to know she killed the Flash, but that is all. She refuses to act in any part of their attempt to capture Zoom. Mr. Wells offers his speed-dampening serum as a way to catch Zoom, Cisco just needs to build gun to inject it with. Dr. Snow is not on board with that as it would mirror Captain Cold’s Gun that Cisco built, and possibly create another Flash villain named Sergeant Slow. Funny enough Cisco’s only reason for not letting that happen is because the name is awful. The Earth 2 Flashbacks, the first of which Shows Wells and his daughter, Jessie, who is oh-so-Quick (her dad even says so), having a small falling out. Later we find out Zoom attacks Jessie’s College, and she goes missing. Honestly, the whole Jessie quick talk is like they’re trying to throw it in our face, Yo, Yo this is Jessie Quick! Just incase you didn’t catch it the first time. The same thing with Vibe, although they try to make it funny. The Vibe this and Vibe that, it’s getting a little redundant. The only other thing a really didn’t like about the show was how Joe shut Patty down… When She Was Totally Right!! This girl needs to get into the fold and be apart of Team Flash, Dr. Light would not have escaped if she was. The Linda and Iris Friendship that really strengthens this episode, is slightly awkward. Linda is attached to Iris because of her connection with the Flash, who is taking care of her doppelganger problem. Iris is trying to help her for Barry sake. While Iris wants to help Barry protect Linda, she also believes Linda should have a say in what happens. When The Flash needs a Dr. Light to act out a scene in order to capture Zoom, they ask Linda and she accepts. Words cannot express how awesome the last part of this episode was! Zoom uses Linda like Barry did to lure him out. After saving Linda’s Life, Barry does not bow down. The Flash goes Zeus on Zoom, but Zoom tosses it right back with scary ease. Our faith in the Flash falters if only for a moment as Barry is ready for round two! Taking speed out of the question, Barry gets a few good punches in, but then Zoom dominates. A crack that hurts just to hear it, sounds, and we know Barry is truly in trouble. Mr. Wells tries to help by shooting Zoom with the Speed-dampening serum, but Zoom catches the injection pod in mid air, and takes the one Barry has and inject two into The Flash. 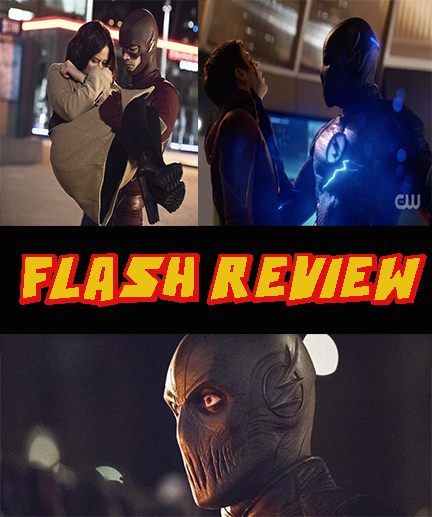 Helpless, The Flash, beaten and bloodied, is dragged around town by Zoom to humiliate him and tell everyone that the Flash cannot save them. The sheer power, speed, and evilness in Zoom is awful! When Zoom returns to Star Labs and unmasks Barry, he taunts Wells. As he begins to actually steal Barry’s Speed Cisco catches Zoom by surprise. He hits him with the Speed-dampening serum, and it affects him enough to retreat. Now the question is, when will we see him again? Stunned by the sheer brutal-ness of Zoom, I knew Barry needs time to heal, but when he wake… and they end the episode with “I, I Can’t Feel My Legs. Guys, I Can’t Feel My Legs!” Urgh! The Flash must learn to walk and run again! *Zoom catching the bullets at the Police station, and Patty’s face! *Robert Queen being the Arrow on Earth 2. *Wells flipping out on Cisco about his Vibes. *Patty confronting Joe and telling him about her and Barry’s kiss. *Barry fidgeting because he landed awkwardly during their fake fight. I know a lot of people didn’t like Patty’s “Omg, babies faces going through tunnels video” Moment, but I’m glad to not be the only one to search it on youtube in the last week! It’s human and adding small things like that remind you, that this could be our world because they are people just like us!